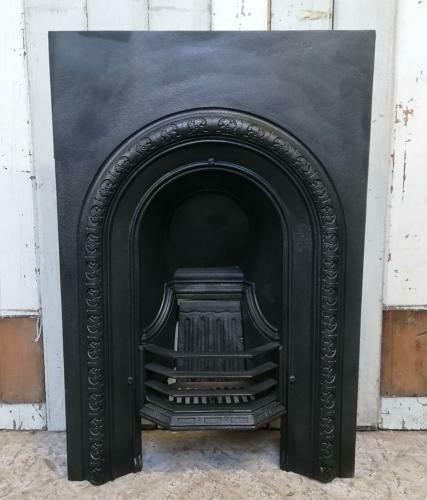 A pretty cast iron Victorian bedroom fire insert. The fire has a traditional style with an arched fire opening, surrounded by decorative border with a repeating flower design. The back of the fire has decorative moulded detailing and the fire has the original shaped front bars. The fire has been blacked and polished and has a good finish. The fire is petite, ideal for a bedroom or smaller reception room. The insert is designed to be paired with a fire surround. The fire is antique and therefore has some wear and repaired damage. The left corner of the fire (when looking at the fire front) has been snapped and repaired. The repair is solid and the repaired line is faint from the front. The repair can be seen from the back, please see pictures for details. The top plate is a replacement that has been made using tin. The fire brick is solid but has not been secured and will need purchaser to fix with fire cement. The front has some small casting marks and scratches. The back of the fire has surface rust as expected. The insert is a pretty item with a traditional design that would suit a period property and will look lovely with a fire surround.